Lack of a default layout for different environments (development, testing, production, and yours). Settings require the full path to media directory, and there is no default place. I like templates to be at the app-level instead of project-level. And a few more I’m not remembering now. To solve these problems, I created a django default template for my projects with my conventions, that you can use or fork to adapt to your own if you want. I could go with a more fancy solution for the environments, but since I don’t have a testing server, the settings-prod works pretty fine. Other option is to check sys.uname to see if it’s running in the production server or not. 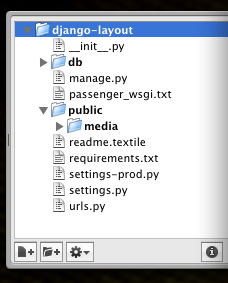 Since I got my own VPS, I’ve been deploying django using passenger (including this wiki) and it’s working pretty fine, so I am now using the passenger branch of the layout.